In 1999 a high-penetration, no-storage, wind-diesel power system was installed by TDX Power and Northern Power Systems to run an industrial facility and airport complex on the island of St. Paul in the Bering Sea. The project was largely privately funded and initially included a 225 kW Vestas V27 wind turbine. This project was later expanded and now includes three V27 turbines, two 150 kW Volvo diesel engine generators, a synchronous condenser, a 27,000 liter insulated hot water tank, approximately 305 m (1,000 feet) of hot water piping, and a microprocessor-based control system capable of providing fully automatic plant operation. The electrical load for this industrial facility averages about 70 kW, but the system also supplies the primary space heating for the facility, using excess power from the wind generators and thermal energy from the diesel plant. When the wind generation exceeds demand by a specific margin, the engines automatically shut off, and the wind turbine meets the electrical demand with excess power diverted to the hot water tank. When wind power is insufficient to meet the load, the engines are engaged to provide continuous electric supply as well as energy to the hot water system as needed. 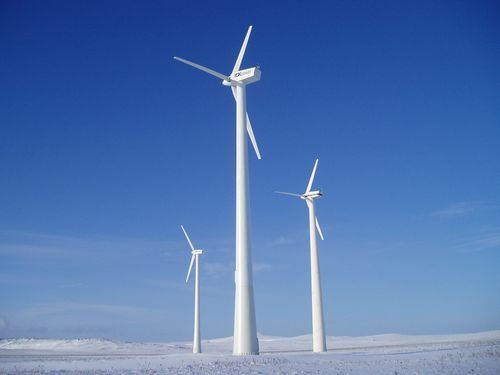 The total 500 kW wind-diesel co-generation system cost approximately $1.2 million. According to TDX, the system has eliminated $200,000 per year in utility electric charges and $50,000 per year in diesel heating fuel. V27 Wind Turbines on St. Paul Island. The operating wind turbines have had a capacity factor of almost 32% and good turbine availability following an initial problem with the original turbines’ generator. The average penetration for this system has been almost 55%, with significant times when the system operates with both of its diesel generators off. Since January of 2005, wind energy has saved over an estimated 150,000 gallons of diesel fuel, about 50% of the expected consumption without wind energy.